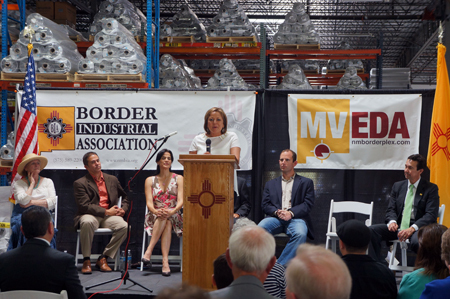 On July 25th, the IBA helped coordinate a visit by Governor Susana Martinez and New Mexico Economic Development Department Secretary Jon Barela to Santa Teresa. These officials were in town to announce two new companies that are locating to the Santa Teresa region. W Silver Recycling, a metal recycling company and Twin Cities, a warehousing, distribution and logistics company will both be opening their doors in Santa Teresa bringing 20 and 50 jobs respectively. Both companies also anticipate growth and the hiring of more employees in the near future. From L to R: NM Senate President Pro-tem Senator Mary Kay Papen, Mesilla Valley Economic Development Alliance President/CEO Davin Lopez, Border Industrial Association President Miriam Baca Kotkowski, Governor Susana Martinez, Owner of W Silver Recycling Lane Gaddy, and NM Economic Development Secretary John Barela. W. Silver Recycling is an international recycling company headquartered in the heart of El Paso’s industrial district and minutes from the US-Mexico Border. W Silver has been operating for over 90 years servicing the unique by-product needs of manufacturers in the southwest United States and Mexico. Twin Cities Services, Inc. was established in 1979 as a warehousing, distribution and logistics company to expedite the storage and transportation of products in the El Paso/Juarez area. In 1998, Twin Cities began operations as a container holding facility for ocean carriers. With the relocation of the Union Pacific Intermodal facility to Santa Teresa, Twin Cities purchased 32 acres in the Santa Teresa industrial area to move and store containers and trailers for its clients. The company will have the capacity to handle loaded and empty containers for transfer or storage.